Whatever the terrain, Tacoma is king of the hill. Rebuilt inside and out with an all-new powertrain and enhanced suspension tuning, Tacoma is ready for dirt stomping adventurers. With a legacy of off-road victories and over seven million units sold in North America since 1964, Toyota revitalizes the midsize truck segment with the introduction of the all-new 2016 Tacoma. Toyota Technical Center in Ann Arbor, Michigan. Starting with the frame, they added high strength steel to enhance rigidity and overall strength. Ultra-high strength steel was integrated into the body shell using a new hot stamping process that reduces weight. The new Tacoma will be powered by a 2.7-litre four-cylinder engine and an all-new, segment-first 3.5-litre Atkinson cycle V6 equipped with Toyota’s D-4S technology, featuring both direct and port fuel injection. Inspired by desert racing, CALTY designers in Newport Beach, Calif. and Ann Arbor, Michigan made the new Tacoma all about recreational action and athletic agility. To achieve this, the new Tacoma’s wheel flares are strong and muscular for greater wheel travel and the high-lift image reflects its purposeful capability. Four new wheel designs range from 16 to 18 inches. Tacoma’s tough exterior is complemented by an interior that conveys a sport truck image reflecting an athletic, go anywhere, off-road feel. Once inside, drivers will notice a “handlebar” design theme in the instrument panel for a more driver-focused experience. The new Tacoma will be available in four grades in both 4x2 and 4x4 configurations. Active Traction Control, and Crawl Control. Engaging Crawl Control allows the driver to select a speed of 1-5 mph. The Crawl Control system takes over the acceleration and braking, allowing the driver to focus solely on steering. 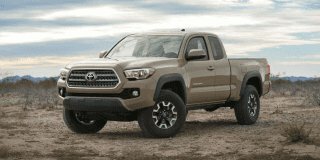 Tacoma is assembled at Toyota Motor Manufacturing, Texas (TMMTX) in San Antonio and Toyota Motor Manufacturing, Baja California (TMMBC) in Baja California, Mexico. Both facilities play a major role in carrying on Tacoma’s legendary reputation for quality, durability and reliability (QDR). It’s QDR has also helped Tacoma earn the 2014 Winner of Canadian Black Book’s Best Retained Value Award for five consecutive years. The all-new Tacoma builds on this tradition with improvement in every aspect over the current Tacoma including, design, ruggedness, and performance improvements in horsepower and fuel efficiency. Backed by 50 years of unwavering capability, an unbreakable attitude, and an off-road racing heritage, the all-new Tacoma is hungry for adventure and ready to tackle almost any challenge that it encounters. It truly is the ultimate tool for the outdoor enthusiast. For more information on the 2016 Tacoma visit toyota.ca/newtacoma.